With the file sizes of our pictures and videos growing at such a fast rate, storage solutions that were fine a few years ago are suddenly feeling pretty cramped. While it's true that you can store all of this stuff in the cloud, there are potential security and privacy concerns that many prefer to avoid by hosting their own data on their own hardware. Companies like Thecus, QNAP, and Synology are leaders in the market when it comes to home storage solutions. We've reviewed many of them in the past, including the Thecus N5550, so were excited to take a look at their latest offering, the Thecus N7710-G. Aside from increasing the drive bays to seven, the N7710-G adds a 10-gig network card to increase the speed in which you can access your files. Does it work as expected? Let's find out! The N7710-G packs quite a bit of power under the hood. In addition to an Intel Pentium G850 dual-core CPU, it also has 4GB of DDR3 ECC memory, and two Intel 82574L Gigabit Ethernet ports, as well as HDMI and VGA outputs, two USB 2.0 ports on the front, while the back has four 2.0 ports and two 3.0 ports. 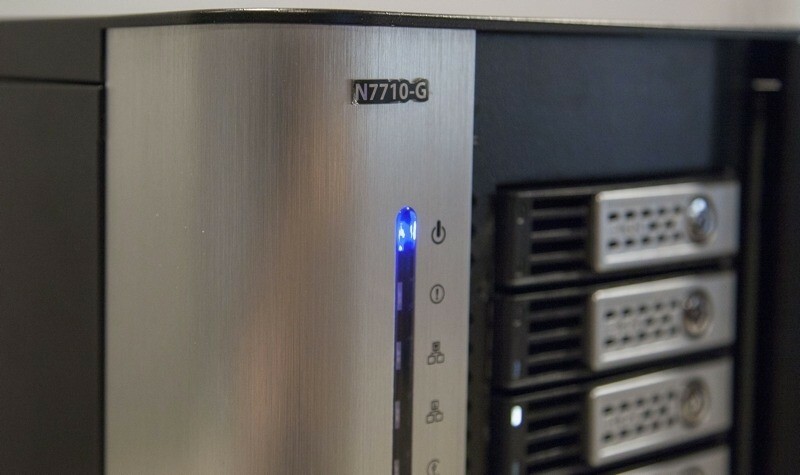 The N7710-G also has room for seven hot-swap drives. This gives you the flexibility of running RAID-6 and still have a lot of usable space left.